Imagine yourself in olden times, tooling around some country roads in your horseless carriage. Lost, you may hail a friendly farmer on the side of the road. “Ahoy there! Can you tell me how to get to Berkshire?” “Of course, fine stranger,” the farmer would reply. “Just stay on this road for a few miles, turn right at the big red barn, then left at the town gazebo. Can’t miss it.” “Thank you, friend!” you yell as you wave your straw hat and go off on your merry way. About a century later, we’re now dependent on our GPS systems and our phones to help us navigate confusing highways and byways. Who among us hasn’t been trying to listen to the nice lady on our Google Maps, in the rain, squinting to see if that street sign says “Harrison” or “Hutchinson”? Now CNET points out, “Twitter users have been reporting that after a recent app update, Google Maps is no longer just using standard directions (like turn left, right, make a U-turn). 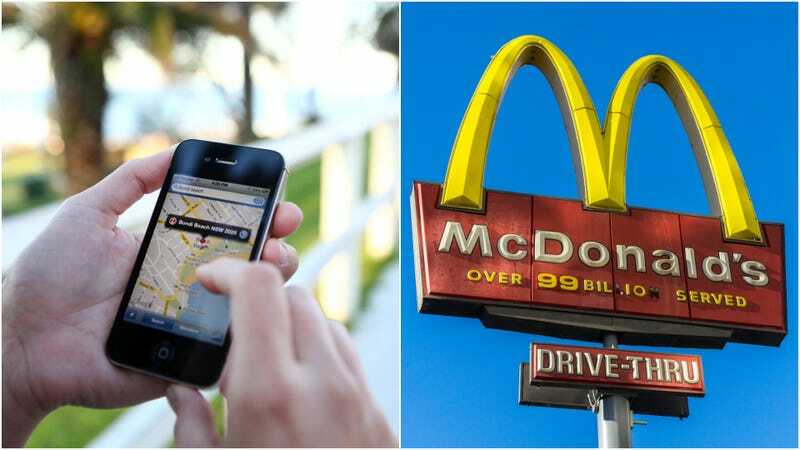 It’s now using landmarks and other points of interest to help make finding your turns just a little easier.” Apparently, Google Maps has decided to embrace the unattractive fast-food landmarks that dot our landscape, and will use the Golden Arches and other common fast-food signs to guide our way. Ask The Salty Waitress: Should I be worried if the server isn&apos;t writing down my order?